Microsoft (NASDAQ:MSFT) is one of the most well-known companies in the entire world. In a perpetual race against Apple (NASDAQ:AAPL) and Amazon (NASDAQ:AMZN) for “Most Valuable Company,” Microsoft has been able to make a name for itself over the past 44 years based on its product line and its openness to growth and innovation. 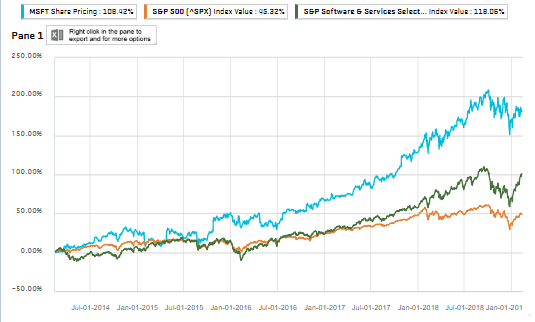 As a company, it has moved line-in-line with the broad Software and Services index, and has outperformed the S&P 500 by 65% over a five-year time frame. The industry itself has promising growth possibilities, with estimates of 4% growth in 2019. 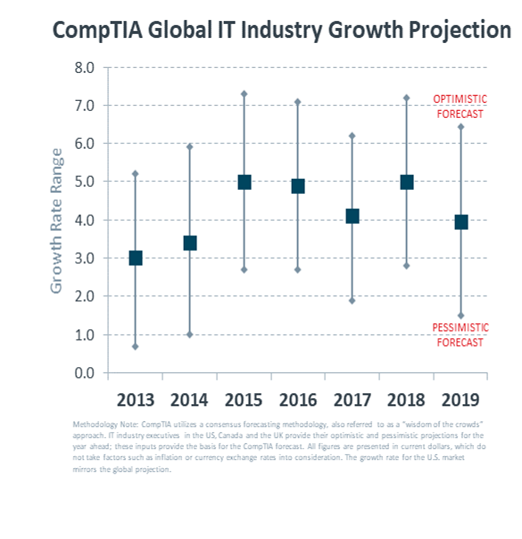 CompTia notes that “the product mix will be an especially important factor, as the high growth rates of emerging categories are expected to more than offset the slow growth mature categories” when looking at the tech industry. This plays into Microsoft’s strategy, as they carry some slow-growth product lines within their More Personal Computing segment, but have strong exposure to emerging categories, such as the Cloud. As technology continues to integrate into our daily lives, and as big tech becomes increasingly more competitive, it is important to pay attention to key factors that will drive growth in the industry. Artificial Intelligence and the Cloud are two big market opportunities, as well as strategic alliances both inside and outside the industry. 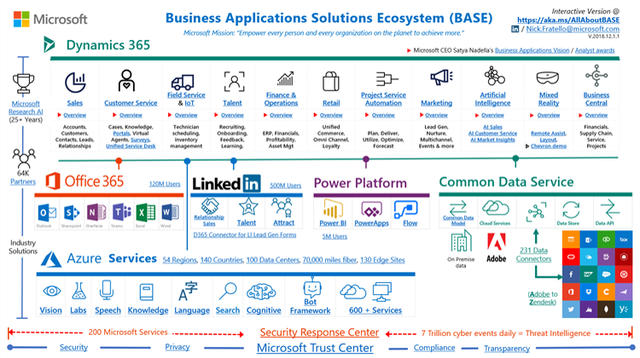 MSFT has strong exposure to each of these three growth factors. Cloud demand, which is evolving constantly, will be a huge play as Microsoft continues to battle for market share. Artificial Intelligence, and all the applications it carries in the healthcare industry and other spaces, will be another big growth driver. Finally, the company has been building out partnerships and collaborations across companies as they continue to manage their economies of scales. 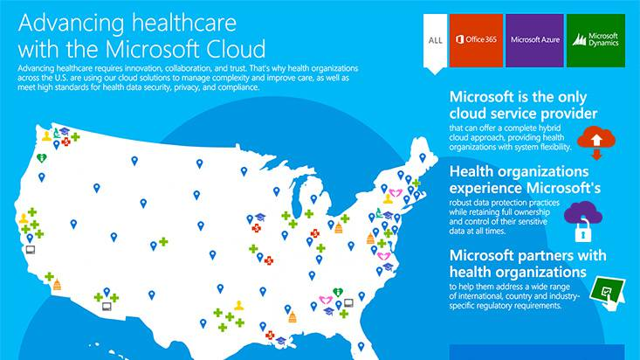 MSFT has managed to create a niche for themselves in this $5T software and services industry. They operate through three key business segments, Productivity and Business Processes, Intelligent Cloud, and More Personal Computing. Their business ecosystem is rather complex, and continues to grow through acquisitions and partnerships. Over the past month alone, MSFT has entered into several deals to improve their standing in the industry. On February 4th, they purchased the DataSense platform. On January 15th, they entered into a seven-year agreement with Walgreens to provide digital health opportunities. On January 7th, it was announced that they entered a collaboration with Kroger to work on data-driven connected store experiences. They teamed up with MasterCard in early December to work on digital identity management. They opened a joint-engineering office with Walmart in early November. Finally, they purchased GitHub Inc in a $7.5 billion acquisition in October. The company is priming itself for growth, and taking each opportunity as they come. 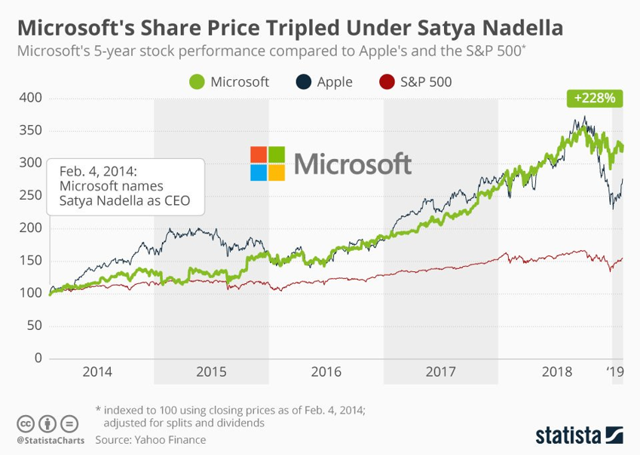 Satya Nadella is a key driver of the company’s performance over the past several years. Since he became CEO in 2014, the stock price has increased by 228%, a larger gain than both Apple and the S&P 500. Overall, the governance of the company is strong, driven by a diverse Board of Directors that carries only two external directors. They scored the best score possible on three of the QualityScore pillars, scoring well in Audit, Board, and Shareholder Rights. People are afraid of a takeover of machine intelligence. 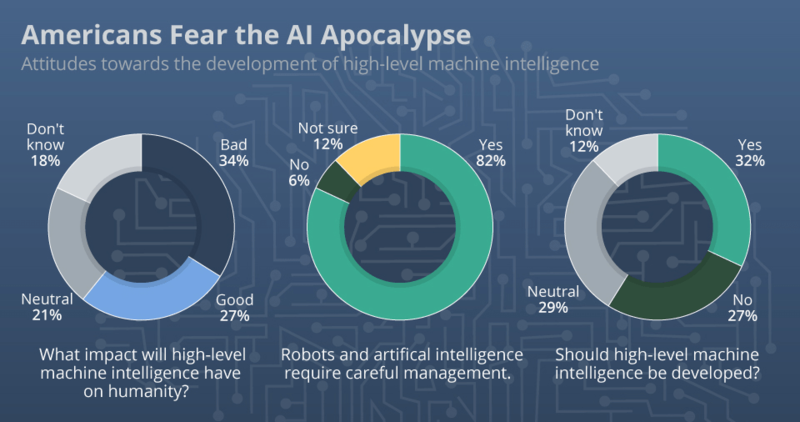 Over one-third of respondents to a survey released by Center for the Governance of AI believe that high-end machine intelligence will have a “bad” effect on humanity. Over 80% of respondents believe that robots and artificial intelligence require careful management. And almost one-third think that high-level machine intelligence should not be developed at all, with another one-third completely neutral in their opinion. 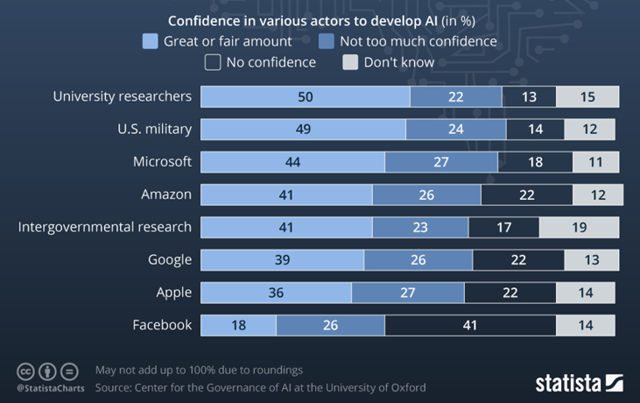 Despite the uncertainty, MSFT is the company that people have the most trust in for the development of artificial intelligence. The fact that consumers trust MSFT the most to do this job is extremely promising, especially considering that AI is a key industry growth factor. Microsoft is also implementing artificial technology in the healthcare space, highlighted by their recent partnership with Walgreens Boot Alliance. They have several key alliances in the industry, highlighting the earlier point about partnerships, ranging from Veradigm, a clinical research company, to ThoughtWire, an EarlyWarning application that can detect the risk of a heart attack. Artificial Intelligence does carry a significant risk, and companies in the process of developing the software have made sure that consumers are aware of the risks that it carries. However, Microsoft is working on “democratizing AI” with aggressive investments across the board. Artificial intelligence as a market is expected to experienced a 62.9% CAGR from 2016 to 2022, growing from $8B in revenue to almost $50B by 2020. Microsoft will also be implementing their Azure API to share health data across the cloud. The cloud has become a large focus for many of the top companies, with Amazon leading the charge and Google (NASDAQ:GOOGL) spending $25.5b in 2018 capex to try to gain market share. Amazon is a dominant player in this space with their product, Amazon Web Services. They dominate across every single region, and despite MSFT Azure’s 76% growth in sales for the most recent quarter, that dominance isn’t going away any time soon. Microsoft is close behind, as evidenced by their second place ranking in most geographic locations. 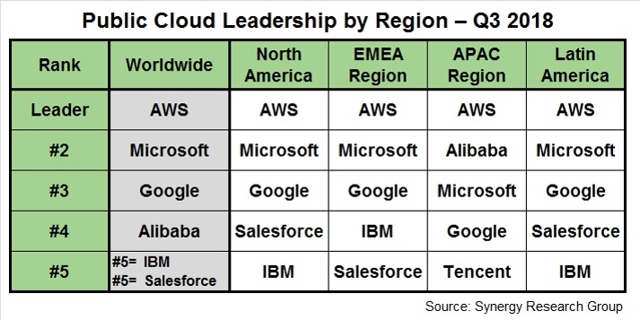 MSFT leads in Enterprise SaaS, and also has a leg up on Amazon in private cloud. But this segment of the industry is highly competitive. The Cloud itself is posed for tremendous growth. Over the past three years, there has been an $80b increase in IaaS + SaaS revenues. 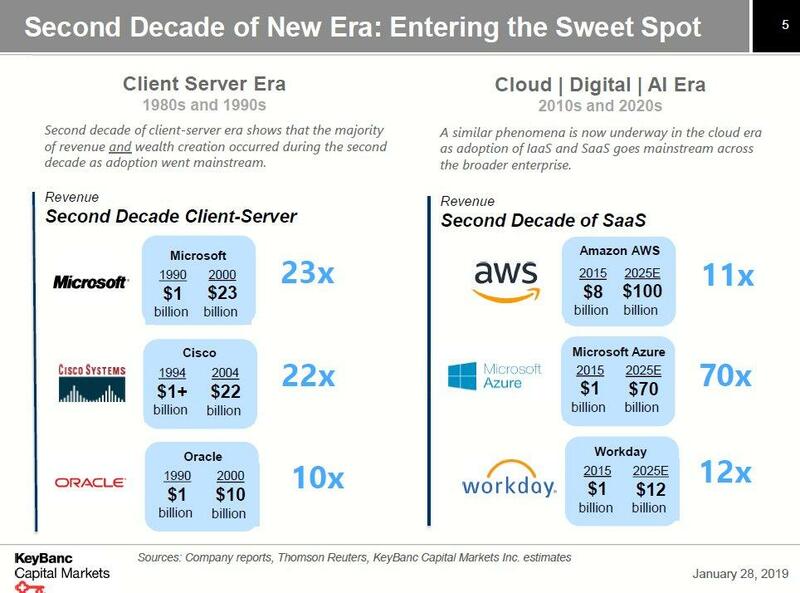 These are variances of cloud platforms, with IaaS being more hands on for users, and SaaS completely managed by an outside company. Over the next five years, there is expected to be an $300B increase revenues for IaaS + SaaS, which represents a growth of $60B per year versus the five-year average yearly growth of $26.7B. Market penetration in the $1.8T tech market is expected to increase to grow to 24% into the coming years, as compared to the 7% penetration in 2018. 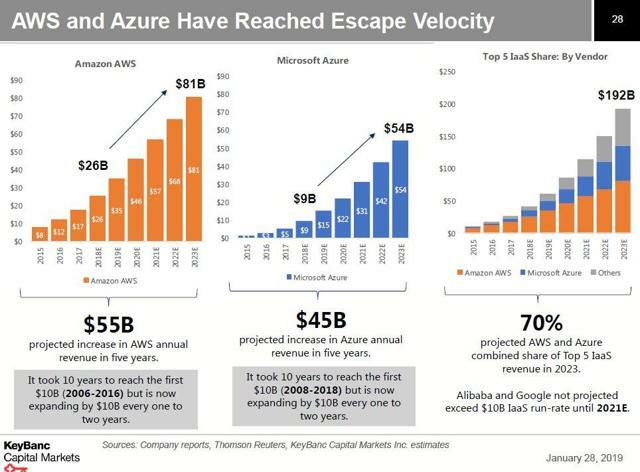 MSFT is expected to have 70x revenue growth from their Azure platform versus AMZN’S 11x growth from their AWS platform. AWS has an advantage over Azure because they were first to market back in 2006. It took the company ten years, from 2006 to 2016, to make the first $10B in revenue off the product, but only two years to add the next $10B. Now they are expected to make $10B in 2019 alone. Microsoft is working on the same trajectory, but Amazon has a two-year head start. After 2020 is when MSFT should see the quick gains that their top competitor has experienced. They will still lag behind, but momentum will be on their side, with projections to add $10B in revenue in 2021E. Both companies are not too transparent with the exact amount of money that they make off their products. AWS had experienced 46.94% growth in revenue year-over-year from FY17 to FY18, which is a contraction from previous growth numbers. Doing the same analysis on MSFT yields a 17.6% year-over-year growth, which is much smaller than Amazon’s growth metric. AWS leads in Quarter over Quarter growth too, posting 45.3% growth in revenues from Q318 to Q418 versus MSFT’s 20.3% growth over a similar time frame. Microsoft’s Azure does have some advantages over its competitors, most notably in terms of pricing. They lead across on-demand pricing options. AWS is usually not the cheapest option, but they do offer more services than their counterparts. 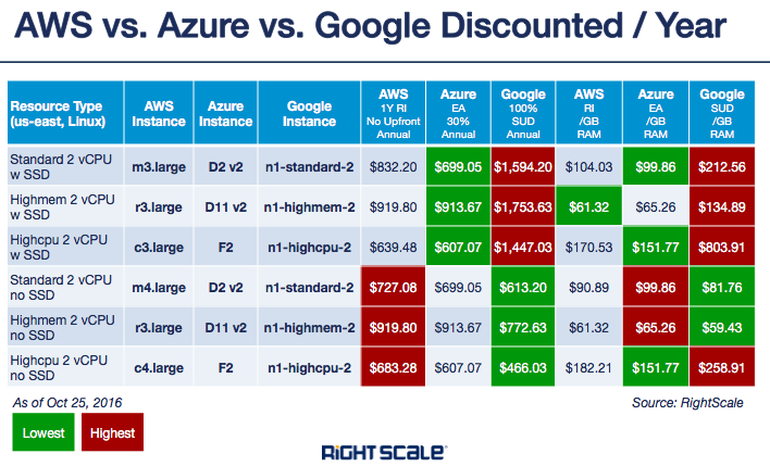 Google’s Cloud product line tends to be the most expensive. 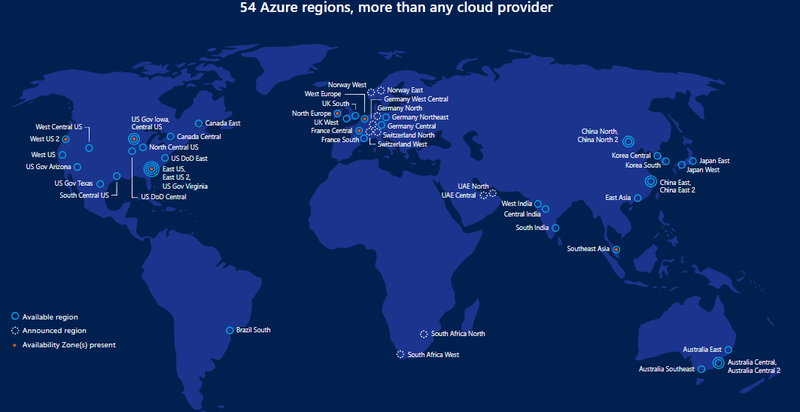 Microsoft also has a larger reach than their cloud competitors, located in 54 regions across the globe. 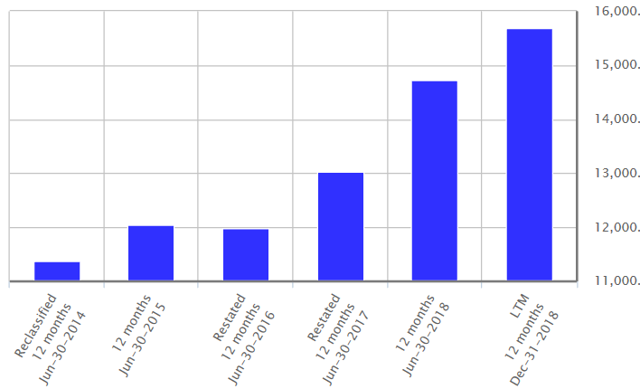 They also have 120+ new subscribers to their product every month. It has the largest compliance offering in the industry, which is important for longevity in the corporate world. 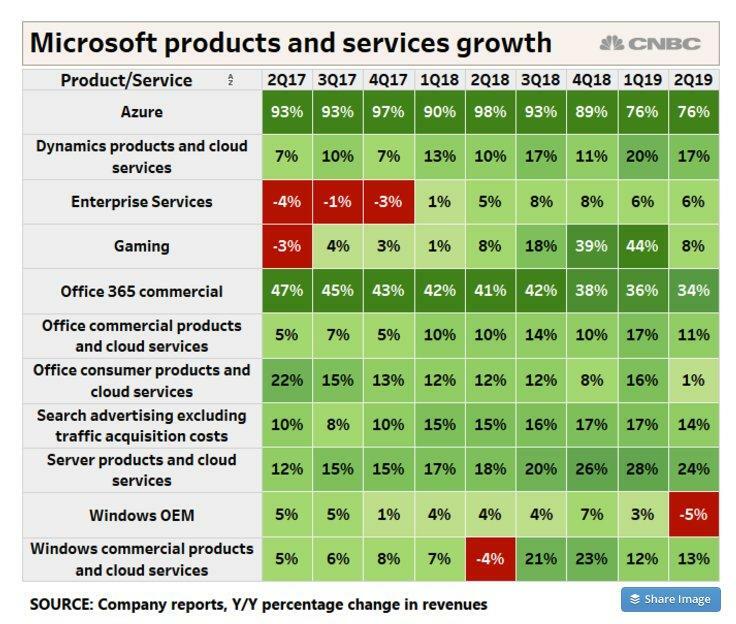 MSFT is experiencing growth in most of their key areas, and in most of the key growth opportunities for the industry. Azure will be a huge opportunity for them, as well as gaming and hardware offerings. They missed on revenue for Personal Computing in the most recent quarter, with the company pointing to a supply chain mishap as the reason behind the this. 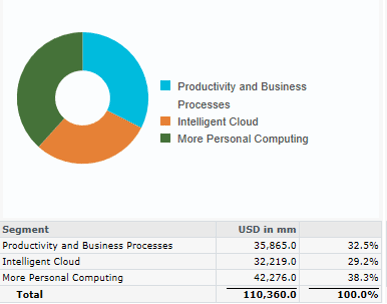 However, their Intelligent Cloud segment beat expectations by 10.7%. Office 365 Commercial has also been a strong growth segment for the company, with the subscriber base growing 2.5% from Q1. They have had trouble with Office consumer products, and will have to consider how to handle the competition in that space. 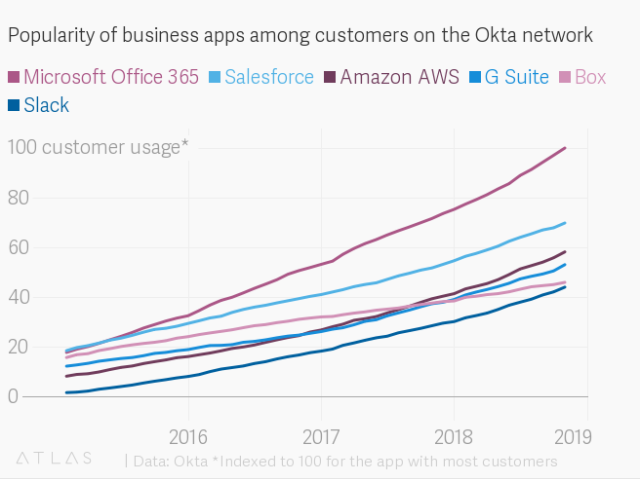 Okta, which is an integration network for different cloud platforms, has seen an extreme increase in popularity for Microsoft Office 365. 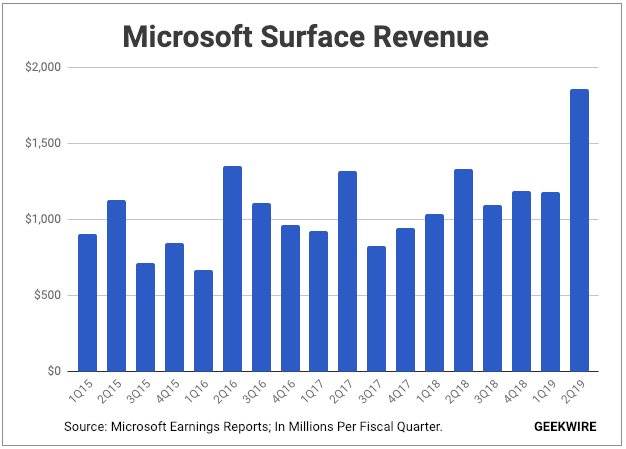 The Surface device also just posted its “biggest quarter ever“, with $1.86 billion in revenue for Q219, which is a 39% increase year over year. The CFO is expecting 20% revenue growth next quarter. There have been several new devices in the product line, with whispers of a product called “Andromeda,” a “foldable, dual-screen device” that might be Microsoft’s next attempt at penetrating the smartphone market. A benefit that Microsoft carries relative to competitors is their product differentiation and their geographical reach. The company gets about equal revenue streams from their Productivity and Business Processes, Intelligent Cloud, and More Personal Computing segments. The latter segment has experienced the slowest growth year-over-year at 7.6%, but the other two segments are line-in-line, at 20.1% and 17.6%, respectively. For comparison, Amazon gets approximately 50% of their sales from online stores, but they have experienced monumental growth in each of their respective categories. AWS growth numbers, as discussed throughout this article, is going to be a continued benchmark that the rest of the industry will try to meet. 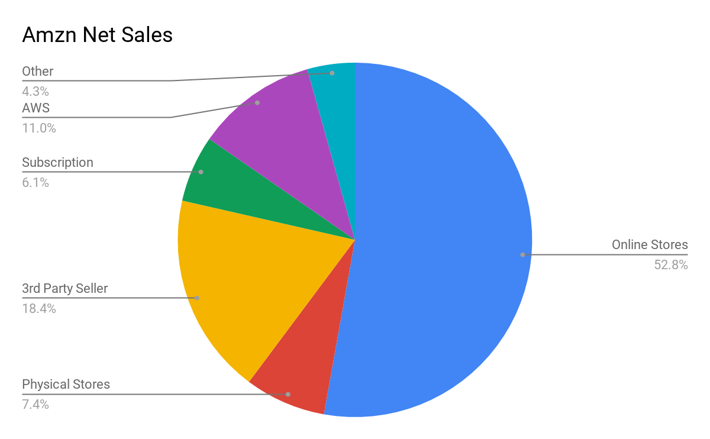 Amazon is much more reliant on US based sales, with 68% of their revenue coming from domestic sources. MSFT gets approximately 50.7% of their revenue from the US, and the other half from other countries. Amazon gets 20.6% of their revenue from Germany, the UK, and Japan, with the rest of the world representing 10.5% of a revenue source. Amazon has outperformed Microsoft and the industry over the past three years. Microsoft has moved right in line with the S&P 500 Software Index, returning 111.8% versus the index’s 115.18% performance. This means that Microsoft has room to close the gap, and potentially catch up to Amazon’s 215.79% return. In terms of valuation, it is common knowledge that Amazon is expensively traded. The tech sector as a whole has carried massive valuations for the past several years. Microsoft has a TEV / EBITDA of 15.44 as compared to Amazon’s 28.43. 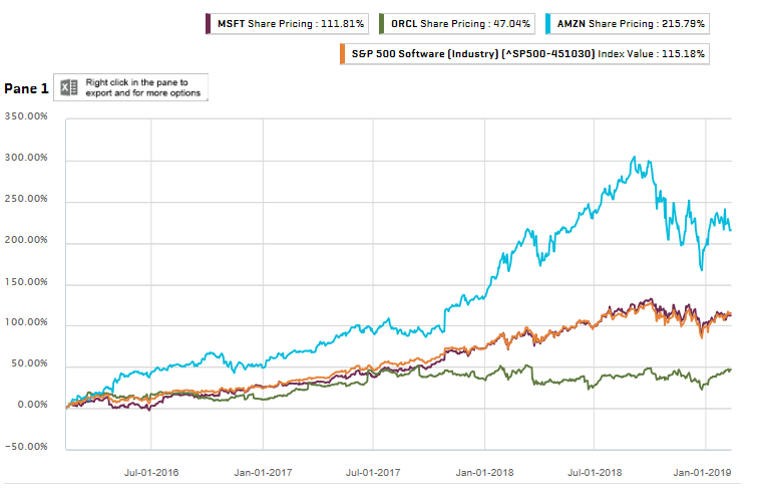 The industry, represented by the orange line, has a value of 19.92, so using that metric, MSFT trades at a less expensive valuation as compared to the industry as a whole. Microsoft is strong in terms of operational performance and liquidity, but they lag behind their peers in terms of solvency. Their interest coverage ratios are lower than their competitors, notably their EBITDA/Interest Expense and FFO to Total Debt. Total Debt to Capital is almost double that of their peers, as well as Total Debt to Revenue. The company has been heavily investing in R&D, which is good for their continued growth. It is also important that they do this in the face of the competitive power that Amazon carries in the cloud space. 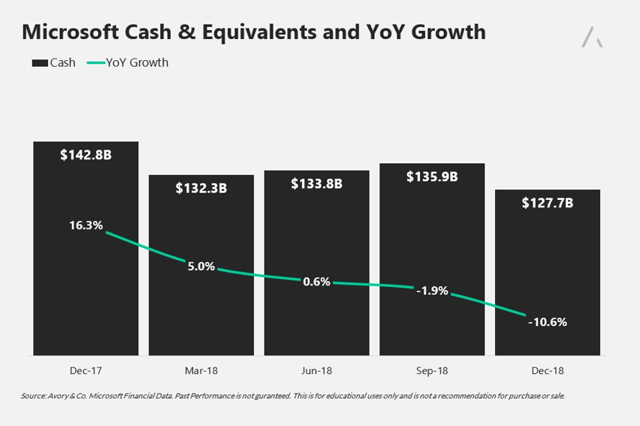 Their cash flows haven’t been as strong as they used to be, with year over year growth compressing almost 9% for the most recent quarter. Their free cash flow has also compressed, but only by 1.8% for year-over-year in December 18. That’s a much stronger metric than the 17.2% negative growth that occurred in the earlier part of 2018. Microsoft has a strong brand name, and a diversified product portfolio. They are open to collaboration and partnerships. They are exposed to some weaknesses, like not taking advantage of potential economies of scale, and potential overexposure in some aspects of the industry that they underperform in, such as consumer products. If we enter into a global slowdown, demand for products that Microsoft offers will more than likely decline, and there is the potential for regulatory framework to hurt the business. 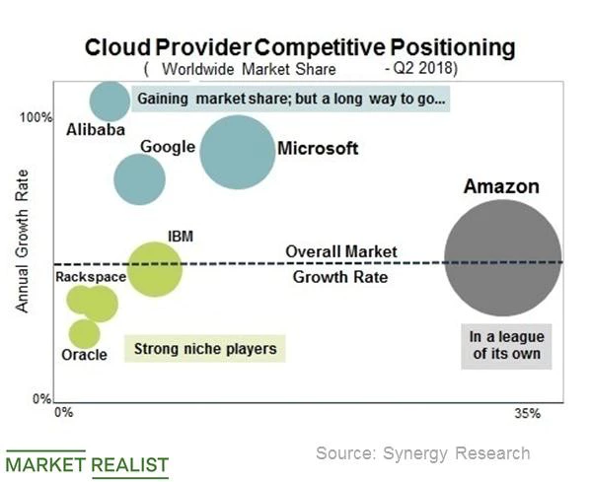 But overall, the cloud space offers them continued growth, they are fairly valued, and they have a number of growth opportunities outside the cloud space through gaming and the expansion of their Surface product line. They will need to focus on improving their cash flow, but they have experienced strong revenue growth that is expected to remain stable into the future, large gross profit margins, and strong net income margins. All of their profitability margins improved over the course of 2018, and it seems as though the company is ironing out some problems it had in the past. MSFT is a constant in a constantly changing industry, and would be a great value-add to portfolios that need a less risky way to get exposure to the tech industry. (CNN) — US airline passengers who don’t identify as “male” or “female” will soon have more gender options to choose when booking tickets. CNN’s Marnie Hunter and Katia Hetter contributed to this report. In morning trade the Blackmores Limited (ASX: BKL) share price has crashed lower following the release of its half year results. At the time of writing the health supplements company’s shares are down 34.5% to $80.91. For the six months ended December 31, Blackmores achieved record half year revenue of $319 million and a net profit after tax of $34 million. Revenue was up 11% on the prior corresponding period, whereas net profit was flat. The company’s CEO, Richard Henfrey, blamed the lack of profit growth on its investment in advertising and promotion and softening growth in China. Revenue in Australia and New Zealand came in at $144 million during the half, which was up $23 million or 19% on the prior corresponding period. This was driven by both domestic growth and continued increased levels of sales through Australian retailers focused on servicing China export channels. Excluding Australian retailers selling overseas, domestic sales growth is estimated to have been around 6% for the half year. The company’s China segment posted an 11% decline in half year sales. However, when China-influenced sales through Australian retailers are taken into account, the company estimates growth in sales to Chinese consumers to be around 8%. Across the rest of Asia the company recorded strong levels of sales growth in a number of markets. In Korea sales increased 67%, in Taiwan they rose 150%, and in Hong Kong they were up 39% on the prior corresponding period. Finally, supporting this growth was the company’s BioCeuticals business which grew sales by 7% during the half. However, due to the increased investments and softer China sales, this ultimately led to flat earnings per share of 198.9 cents and an interim dividend of $1.50 per share. The latter was in line with the prior period. Management’s outlook for the second half and full year was reasonably underwhelming. It expects modest full year revenue growth after warning that Chinese sales in the third quarter have been impacted by changing ways that consumers purchase its products, higher inventory levels, and softening consumer sentiment. One small positive is that a Business Improvement Program has been established and is targeting $60 million of savings over the next three years. I thought the company’s performance in the first half of FY 2019 was bitterly disappointing. Blackmores has been given the benefit of the doubt from many investors over the last two to three years, but I suspect this result could be the straw that breaks the camel’s back. I intend to stay clear of its shares until its performance both improves and becomes more consistent. Until then, I’ll be looking at fellow export-focused companies A2 Milk Company Ltd (ASX: A2M) and Treasury Wine Estates Ltd (ASX: TWE) instead. In addition to a2 Milk and Treasury Wine Estates, I think these growth shares could be great options for growth investors. Motley Fool contributor James Mickleboro has no position in any of the stocks mentioned. The Motley Fool Australia owns shares of and has recommended Blackmores Limited and Treasury Wine Estates Limited. The Motley Fool Australia owns shares of A2 Milk. We Fools may not all hold the same opinions, but we all believe that considering a diverse range of insights makes us better investors. The Motley Fool has a disclosure policy. This article contains general investment advice only (under AFSL 400691). Authorised by Scott Phillips. Four American Airlines flight attendants let loose in a burlesque-style number caught on camera. The four women, who were off duty, sang and danced to “Big Spender” as they surrounded a man playing an “Executive Platinum” customer while the American Airlines logo was displayed prominently in the background. Video of the moment was posted to Twitter, where it went viral. Now, the Association of Professional Flight Attendants is demanding an investigation into what it called a “demeaning” video. Flight 1954 welcomed what the airline officially dubbed their “youngest customer to date” on the Friday flight and now, the airline will rename the jet, which is ironically named “Born to Be Blue” after the newborn. LONDON – Honda will close its car factory in western England with the potential loss of 3,500 jobs, British media and a local lawmaker said Monday, in another blow to a British economy made jittery by Brexit. Sky News said the Japanese carmaker is to announce Tuesday that the Swindon plant will close in 2022. Honda makes its popular Civic model at the factory, 70 miles (115 km) west of London. Earlier this month, Nissan announced that it would not build a new SUV at its plant in Sunderland, England, as previously planned. Student-loan servicer Navient Corp has rejected a $3.2 billion takeover bid from two investors, a source familiar with the matter told Reuters. Navient’s board voted on Monday to reject the $12.50 per share offer from hedge fund Canyon Capital Advisors and private-equity firm Platinum Equity Advisors, believing it undervalues the company, according to the source. The offer represents a 6.6 percent premium over Navient’s Friday closing price of $11.73 a share. Navient’s advisers had told Canyon it would require a price of more than $15, the Wall Street Journal reported on Monday, citing people familiar with the matter. Wyoming’s Cloud Peak Energy, one of the state’s largest coal producers, eliminated 15 salaried positions last week including most of its government affairs team, the company confirmed Monday to the Star-Tribune. All affected employees were offered severance packages. The Gillette-based firm owns the Antelope and Cordero Rojo mines in Campbell County, the nonoperational Youngs Creek mine in Sheridan County and the Spring Creek mine in Montana. It has struggled more than some of the other large coal producers in Wyoming to face the narrowing coal market since the downturn due, in part, to debt. In a note sent to employees last week, the company explained that the reduction of positions was in response to challenges in the current coal market, noting the company’s recent decision to hire advisers who will considers options for Cloud Peak’s immediate future, like selling the firm. The cuts will reduce the company’s government affairs activities — lobbying efforts from Cheyenne to D.C. — and eliminate most of the expenses in that department. Public affairs positions will be reduced, with remaining staff focused on local operations, according to the note. Cloud Peak’s employee political action committee will be closed soon “as the remaining funds are contributed,” the note states. The company’s press office did not immediately comment on emailed questions asking for more details on the layoffs. Layoffs at Cloud Peak are not the first sign of distress from the firm. Cloud Peak’s Altman Z-score, a rating used to determine risk of bankruptcy, is in the distress zone. In November, the company announced that it would lighten its balance sheet by cutting retired employees’ health care benefits. Late that month, the company announced it had hired consultants to consider a range of options for the company’s future, including sale. By December, the New York Stock Exchange had warned the firm that its consistently low stock price would result in a delisting if not improved. Most recently, the company eliminated corporate bonuses that were to be paid out over a period of years and replaced them with lump-sum retention payments to be handed out immediately. Cloud Peak was the only large publicly traded coal firm in Wyoming that did not buckle during the coal downturn. Unlike neighbors Peabody Energy, Alpha Natural Resources and Arch Coal, Cloud Peak had not invested in the metallurgical coal boom that busted in 2015. But while it had not gotten itself into that particular trouble, Cloud Peak did not then benefit from the balance sheet cleansing of bankruptcy. It held on to its debt. The ongoing pressures on Cloud Peak, and others in the coal industry, are the reduced number of customers to buy their coal, cheap competition in the power sector from natural gas and renewables, and the near-elimination of the long-term coal contracts with the power industry that producers once depended on. A record number of coal-fired power plant closures occurred in 2015, with last year recording the second-highest number of retirements. A number of the plant closures in recent years had been recent buyers of Cloud Peak’s coal, including two Texas plants that announced closure in 2017, and a large coal-fired plant in Wisconsin that closed the same year. Her Momoa-themed Samoas are apparently very popular with the local moms. A clever Girl Scout in Colorado is accelerating cookie sales by using the tried-and-true method of augmenting the box with a photo of a buff, shirtless man and his glistening pecs. Charlotte Holmberg, identified as a Top Cookie CEO by the Girl Scouts of Colorado, is using “Aquaman” star Jason Momoa’s picture to move boxes of Samoas — and it’s working, according to Charlotte. “The moms are getting really excited and they’re saying that they need them,” Charlotte told Denver’s KUSA. Charlotte’s mom, who works in marketing, helped her daughter out with the project, after getting the Mamoa/Samoa idea from memes on the Internet. The two then created the box art by printing out photos of Momoa and affixing them to the cookies, which have been renamed “Momoas” as part of the promotional efforts. Charlotte’s “Momoas” have plenty of fans — including a couple of her fellow Girl Scouts, who offered to buy some. News of Charlotte’s clever tactic follows reports of Girl Scouts selling their treats outside pot dispensaries around the country. Last year, a Girl Scout and her father claimed to have sold 312 boxes in only six hours while stationed outside of a marijuana dispensary in San Diego.